The assault on Alexandria by The Wolves is taking place at the same time the group outside is dealing with the herd of walkers distracted by the truck horn. Plan B becomes Plan C and everyone is doing their best to get the walkers back onto the parade route, while hoping they can make it back to whatever is left of the community. If last week’s episode was one that viewers found frightening, this one has to come in a close second. It isn’t told in a linear fashion, because the story is as splintered as the groups are. Rick has left the group to run back to the gates and retrieve the RV. He still has no idea what has happened behind the gates and doesn’t have time to find out. Before he goes, though, he relays some direction to the rest of the group. His posse understands the message, but the Alexandrians who overhear him interpret his words entirely differently, fostering some dissent. Daryl, who is still leading what remains of the walker march with Sasha and Abe, wants to turn back and help Rick, but Rick tells him to move forward. Daryl has another idea, though, and leaves his trio. Glenn radios Rick, calling him a “dumbass” as a teasing term of endearment, and his voice alerts a few walkers to Rick’s presence. Only a few, though – not so many that Rick can’t take them out on his own. Only a few, though – not so many that Rick can’t take them out on his own, cutting his hand in the process. The confusion leaves Michonne with an even greater burden as she and Glenn are responsible for getting the others home safely. Glenn and Michonne soon realize that their charges are as helpless and useless as a group of toddlers. The Alexandrians have been in denial about the danger of the walkers. They’re the people who would leave someone behind before they’d sacrifice themselves for the safety of the larger community. So, there’s chaos. Sturgess runs off into the woods which ultimately means he’ll soon be a dead man. David is bitten by a walker, but continues on. Nicholas is in his own near fugue state, staring at carnage while hearing ringing in his ears. Glenn and Michonne lead their group into town and try to find both shelter from the herd and a way to divert them away. In an alleyway, they come across Sturgess, who’s become a walker buffet. A pet shop seems a good place to hole up until a plan can be formulated. Inside, there’s a feeling a mistrust between the Michonne and Glenn and the Alexandrians. When Michonne, in the pet shop with Heath and Annie and Scott, tells them that no one is left behind, they think she means only herself and Glenn. Glenn and Nicholas decide that a fire is the perfect diversion of the walker herd and Nicholas suggests burning an old feed store. The two set out to carry out their end of the plan, while Michonne stays with the rest of the group. David writes a little note to his wife – a love note to be delivered in case he doesn’t make it back. He gives it to Michonne but she hands it back, telling him that he can tell her himself when they get home. Annie, who is injured, thinks she should stay so as not to slow the group down, but, again, Michonne assures them that that’s not going to happen. The Alexandrians still can’t see that their lack of trust is getting them killed, and might possibly put everyone near them at risk. Glenn and Nicholas, now on the street, find a walker. It’s a nineteen year old man who Nicholas one worked with and who he and his friends left behind. Nicholas, finally, decides that it’s his responsibility to finish of his former friend. Meanwhile, inside the pet store, the group hears gunfire which rouses some walkers who are locked in a back room. Michonne knows that they have to be silenced to stop more from coming, but even after they put them down, more walkers surround the store. All the group can do is fight their way out and hope they all remain in one piece. Annie falls and tries to shoot the swarming walkers but is overtaken. Nicholas and Glenn have made it to the feed store but it’s already just a charred shell. Walkers are coming from every direction – towards Glenn and Nicholas, and towards Michonne and her group. When Michonne and company come to a locked gate, most of them make it over. It’s a close call for Michonne but David is dragged back into the herd, his note to Betsy trampled. Glenn and Nicholas also find themselves cornered with their own swarm of walkers to contend with. They climb up onto a dumpster and do their best to fend them off. Nicholas suddenly has the mother of all panic attacks. Glenn tries to snap him out of it telling him that he’s not that man anymore. Nicholas, having received absolution from Glenn, says “Thank you” and shoots himself, falling onto Glenn, and sending both of them into the mass of walkers, who rip into and devour body parts. Michonne is left with only two surviving Alexandrians. They don’t see smoke from the fire that should have been set at the feed store, but Heath wants to believe Glenn and Nicholas are alright. Rick has driven the RV to a spot which he thinks is strategic enough for a rendezvous with the rest of the group. He tries to raise Daryl on the radio, but gets no response. Abe answers Rick and tells him that he and Sasha are going forward as planned. As Rick attends to the cut on his hand, two men burst into the RV and shoot at him. Rick’s radio is open and Daryl hears the shots. He tries calling him but Rick is a little busy. Rick overpowers them and kills them, then searches through their pockets, finding a jar of baby food. He then spots more people and fires through the side of the RV, killing them, as well. 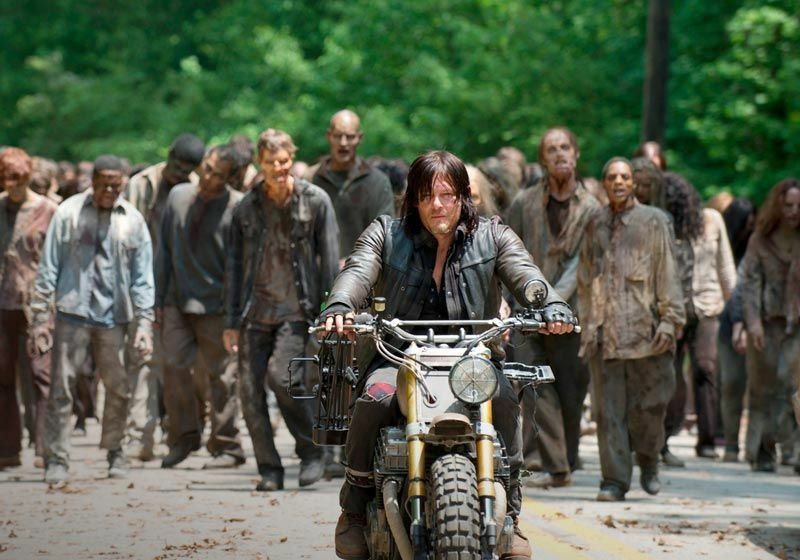 Daryl meets back up with Sasha and Abe and they continue to lead the walker parade away from Alexandria. Rick can’t get the RV to start and the gunfire has drawn another herd of walkers right for him. I guess this is where we talk about THE SCENE. A collective gasp was heard from fans of The Walking Dead as we watched what appeared to be Glenn’s death. Theories have been bandied about, including the notion that Glenn isn’t dear – that the walkers were munching on Nicholas as he fell on top of Glenn. It’s as good a theory as any, I guess. None of us want to see Glenn gone, least of all Maggie who has lost every single person she’s ever loved. It almost seems too cruel, even for TWD, which is as brutal as it is true to itself. The integrity of this show has always been important for Scott Gimple, et al and that’s where I find a problem with THE SCENE. If Glenn is dead, that’s bad. If Glenn isn’t dead, that’s bad, too. Because of the way this show has told its story, realizing that viewers love these characters, especially those who have been there from the beginning, the idea that the writers and producers might be playing a very bad hoax on us is unthinkable. We viewers get it. Major characters die and we go through a TV viewer version of grief. I couldn’t stand it when we lost Hershel. But if this is just a trick, then it’s a disservice to our loyalty to the show. We shouldn’t be expected to think Glenn is dead, only to find he isn’t and that his actual demise will come at some later date. So, for that, as much as it pains me to say it, I hope that Glenn never made it out of the alleyway. Yeah, it’ll be tough to watch Maggie lose one more beloved family member, but it will be a better treatment of TWD and its really smart, really loyal viewers. One more thing, before I wrap this up. Is Morgan responsible for what happened to Rick with The Wolves at the RV? This entry was posted in Walking Dead and tagged #TheWalkingDead, AMC, Daryl, Glenn, Maggie, Michonne, Morgan, Rick, The Walking Dead. Bookmark the permalink. I’ve watched this episode 3 times and I cannot see where Glenn survived. The bottom of the dumpster was too small for his head to fit under. As much as I want to see him survive, I agree with you Empress it would be too unbelievable. I think the next time we see him, he’ll be a walker. Morgan should have taken out the remaining wolves when he had the chance. I cannot understand how he could give them a pass after witnessing their violent carnage. I think he realized his mistake, when he took out the Wolf that was hiding in the house. At the end of the episode we see an angry Morgan and it looks like he is leaving Alexandria. I’m wondering if he is going after them? Maybe he will be the one who’ll save Rick therefore exonerating himself. This season so far has been really good! While I can not agree with Morgan’s strategy and/or mindset and I know he let wolves go (basically telling them to get guns) I could not hold him responsible without knowing the number of the wolves. It could be a larger group than we realize. Ahhhh, but he allowed one or more to live to tell their compadres what happened to the rest of their friends. Okay, it’s all Morgan’s fault!!! This episode started with Glen and when the “dumbass” exchange was made between Glen and Rick, it took me back to when they first encountered one another in the city (perhaps 2nd episode of the series). It gave me a feeling Glen might be taken out, it was a rare occasion, for me to see that coming. Nicholas seemed to experience what some green young men experience in combat – shell shock. I completely agree with your assesment the Alexandrian’s lack of trust and faith has done them in. However, I think Glen’s problem really was he liked to give people second chances. Nicholas tried to kill Glen, for heaven’s sake! That’s not suitable for the brutal world they live in. A world where the healthy people can be your biggest nightmare. The note read, during the Talking Dead, from Gimple, where he said something to the effect Glen would come back in some part, really was unnerving. Thanks for the recap and the commentary on “The Scene”. I couldn’t agree more! TT, what bothered me was the Wolf with the jar of baby food, which I saw as a sign that he was one of those who had been allowed to leave Alexandria by Morgan. Morgan’s desire to handle things peacefully is as dangerous as Glen’s need to give people the benefit of the doubt. I knew the baby food jar was significant at the time and thought of Judith, but I never revisted the thought! I see what you mean and agree! These guys have to buckle down! Like Rick was forced to do for the greater good of the group. You can not only think of yourself when in a group that relies on one another for survival.